UW Medicine hospitals are committed to increasing patient satisfaction and providing the highest-quality care to each patient: Patient care is our first priority. To accomplish this, several UWMC Surgical Services Clinics are implementing a continuous performance improvement model known as lean to streamline their clinical day-to-day operations and ultimately improve the patient experience in the clinic. Main areas of focus include improving how quickly a patient gets an appointment and reducing patient wait times. Some people may have heard of lean in association with the company Toyota. Toyota is known as having a production line where their manufacturing product, in their case an automobile, continuously moves through sequential work stations. Each employee who works on each machine has standardized responsibilities and an expected completion time, enabling them to be consistent in their contribution. All materials are stored systematically so there is no wasted time searching for supplies. In addition, each employee has the authority to ‘stop the line’ (literally) if they see any potential quality issues that needs to be addressed immediately, no matter how big or small, so they can address not just the issue at hand but also identify and eliminate possible systematic issues in the production line. How can these principles be applied in a clinic setting to improve the patient experience? Assume our ‘production line’ is how a patient flows through a clinic. This can start as early as when the patient calls to set up an appointment and then continues all the way down the line to post-operative surgery appointments. Figure 1: Example of how one clinic is analyzing patient flow in an effort to reduce wait times. 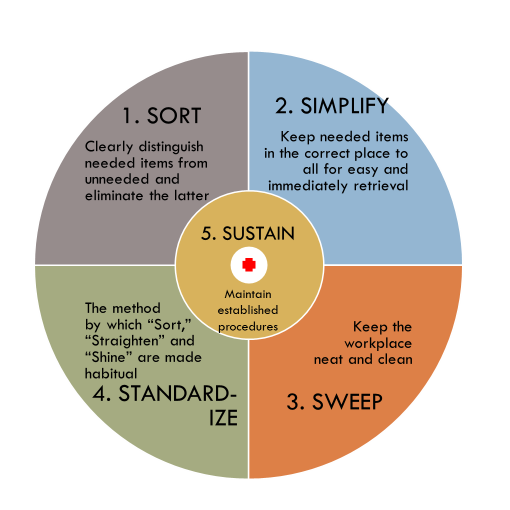 Lean examines the cost of resources to try to find areas to decrease wastefulness in everyday operations that are not contributing to ‘value.’ Value is defined as anything the customer is willing to pay for. The Surgical Specialties Clinics are looking to improve value by reviewing and improving how long it takes for a patient to get in to see a provider after the patient’s initial phone call. This is known as access to care. Clinicians are also analyzing patient wait times and seeing how efficiencies can be gained in the clinic setting by establishing standardized roles and responsibilities for staff, standardizing forms and reducing wasted time searching for things by applying a ‘5S’ approach to supply storage. See graphic for details of the 5S approach. Dr. Gary Mann works at both Seattle Cancer Care Alliance and the University of Washington Medical Center (UWMC). Last year the SCCA sent Dr. Mann, along with a group of 20 physicians and staff, on a lean training tour. During the weeklong tour, they learned both the theory of lean in a classroom setting and then saw in real-world settings the practical applications of a lean approach. They visited a manufacturing company in Utah to view their robust lean system and then returned to Seattle and toured three healthcare organizations to learn how they have implemented lean and how it has improved their performance. 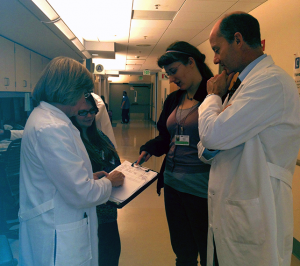 Figure 3: Dr. Mann’s UWMC clinic team huddle consisting of Vic Shorten, RN, Braelynn Atkinson, MA, Sara Murphy, PSS and Gary Mann, MD. Not shown but often present in the huddle is Darlene Brown, PCC. “After the tour I thought a lot about how I can make an impact, how I could not lose this momentum. So I decided I would work with my UWMC clinic.” Dr. Mann reached out and got his clinic staff of patient care coordinator, patient surgery scheduler, nurse and administrative assistant involved. Once they were on board he called to enlist the help of Chris Head, Director of the UWMC Performance Improvement/Lean team. This small group decided they would meet weekly and focus first on reducing patient wait times. They started with team huddles lasting about 10 minutes each day, discussing what could have gone better the previous day and what to anticipate for the upcoming day. Over the next five months, they worked to implement rapid performance improvement. The result? In addition to observing a 28% reduction in patient wait time, they also saw an improvement in their teamwork and working relationships, and were able to standardize the work by role. After seeing this improvement, the Surgical Specialties Clinic wants to continue the success throughout all their clinics. Plastic Surgery has started working to identify areas they want to improve and the Thoracic Surgery Clinic is next in line to start this process. While the benefits to patients are clear: getting appointments quicker or not waiting as long to see a provider, there are also benefits to the healthcare providers in the clinics implementing lean. For one, cutting out inefficiencies in the clinic means the clinic runs on time, staff roles and responsibilities are clear, communication and team work is improved and providers can focus their time on diagnosing patients and preparing for surgery. For more information on how you can implement lean in your clinic or elsewhere in your operations, please contact Kate Curtis at kateking@OBFUSCATEuw.edu.